Illinois: Right Here. Right Now. From its German immigrants bringing their desire for and ability to brew lager, and the origin of powerful prohibition era organized crime families, to what is and isn’t a craft beer, Illinois has a deep history with beer. In 1818, Illinois became the 21st state, and just 19 years later, Chicago was incorporated. Chicago was the fastest growing city in the world at the time, and is now the third largest in the U.S. A major influence on its was the influx of Irish and German immigrants and it wasn’t long before these new residents clashed with the growing temperance movement that was sweeping the nation. Such was the case in Chicago after voters filled city hall with pro-temperance, anti-immigrant officials and the new mayor ordered a ban on Sunday drinking. The mostly native-born police force closed the city’s foreign-owned beer gardens, beerhalls, and taverns but turned a blind eye to “American” taverns that stayed open in violation of the law. This ban inspired protests, which escalated into violence resulted in the Lager Beer Riot. In the end, the immigrants prevailed and it wasn’t long before the demand for beer quickly outpaced supply. And then, making things worse, the Great Chicago Fire in 1871 destroyed 19 breweries. But it wasn’t long before the brewers bounced back and Chicago quickly became a major player in the nation’s brewing scene. Then came the Chicago Beer Wars of the roaring 20s, ushering in a violent era of organized crime that created mobsters such as Johnny Torrio and Al Capone. From day one, Prohibition was not a widely supported cause. It was a war in its own right between rural Protestants and the nation’s urban (immigrant) citizens who were viewed as a threat. So, when prohibition came into effect, organized crime quickly stepped in to fill the void, resulting in powerful organizations that made a fortune bootlegging alcohol throughout the prohibition era. The organized crime speakeasy scene was so prolific during prohibition that at one point, Al Capone purchased more than 250,000 tapping heads from Anheuser-Busch. With the repeal of prohibition, the state of brewing in Illinois remained status-quo for a few decades, with big nation breweries absorbing the smaller ones. Then came businessman John Hall in 1988 with a new brewpub, Goose Island. John Hall wanted to bring flavorful European beer to Chicago, and that desire has led to Chicago’s oldest brewing organization and eventually the next riot involving Chicago brewing. It didn’t take long for interest in Goose Island to establish a reputation of successful craft beer that allowed them to expand beyond the basics and continue their reach into brews with tradition and character. Their reputation of quality craft beer would continue for almost 25 years until March 28, 2011 when the company was sold to Anheuser-Busch, an event that quickly turned the wrath of the craft beer world onto one of its own. One doesn’t have to look far to find articles about people up in arms over the Goose Island sale. While both good and bad opinions exist most trend to the bad, with the controversy boiling down to the definition of craft beer. According to the Brewers Association, a craft brewer is Small, independent and traditional. Because Goose Island is no longer independent, they no longer fit the definition, yet they still produce their own take on traditional beer, and their volume is up, but only to 2.1 million cases. Also, a review of the top 250 beers list shows Goose Island holding 2 of the top 15 spots, indicating that they are making coveted beer despite the controversy. Eschewing all the controversy, this week, we are all in with Goose Island. From their stable, we will be sampling five different brews, 4 Vintage ales, and 1 Bourbon County. Two of the most common brews available from Goose Island are their India Pale Ale, and the Honkers Ale. 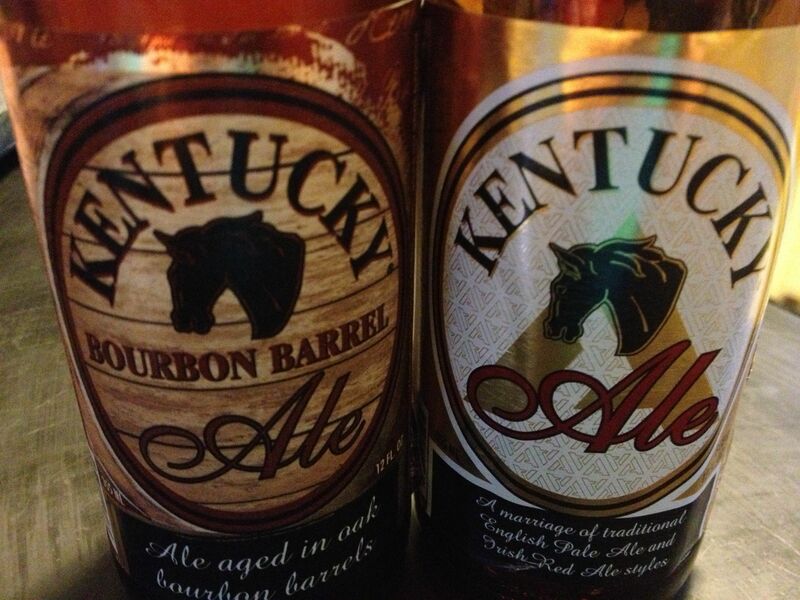 However with its purchase by InBev, these two lines are no longer brewed in Chicago, instead they are brewed by Anheuser-Busch in upstate New York. So we set our sights on some of their more interesting products that are actually brewed in Illinois. This beer, like the rest of the beers in the vintage line, seems to be marketed like a wine. 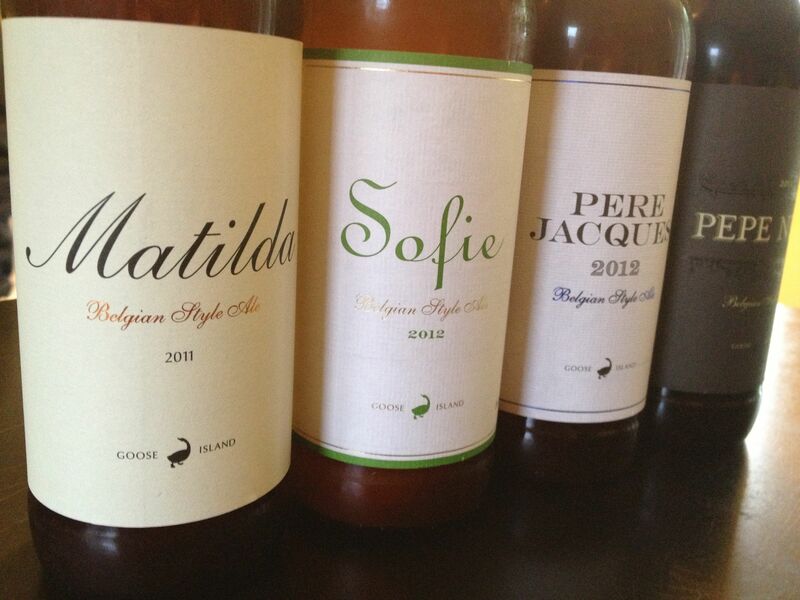 The labels are clean and basic, and all use fonts that implies sophistication. The label for each brew in this series has a name, style and year, prominently displayed. In an era where the mass market beers are focusing on drink-by dates, it is nice to see a different kind of date on the label. The next beer from the Vintage line that we sampled was the Pere Jacques. 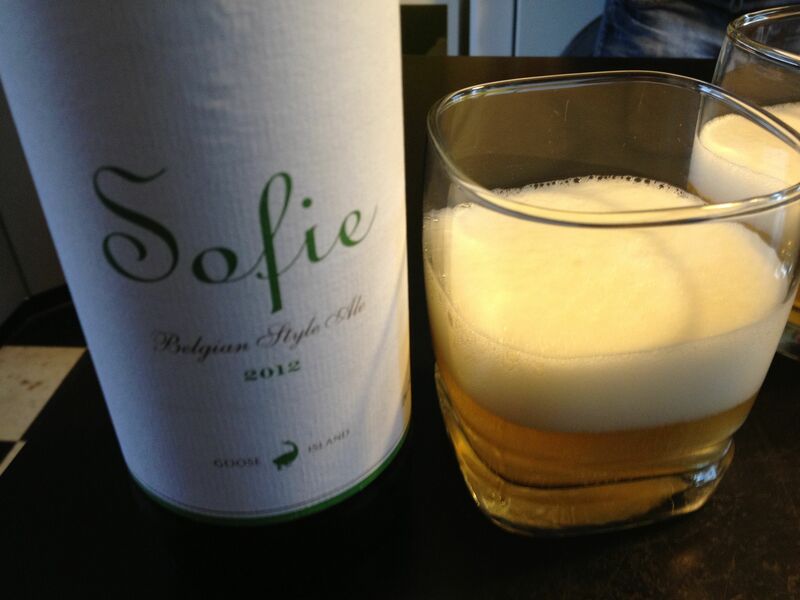 This beer was more caramel in color than the Sofie, and also had a sweet caramel smell to it. Tasting wise, this was the least-liked beer of the day, triggering comments like “Not into this” and “Tastes like burnt varnish.” Overall not an enjoyable beer, and it was quickly disposed of for the next sample. Moving down the line, we opened the Matilda. This beer is brewed with the wild yeast strain Brettanomyces, so right from the start we knew this was going to be different. This beer was quickly pronounced the best of the three so far sampled. It had really interesting character and the use of the Brett was perfectly executed. Just enough to make it unique and interesting. 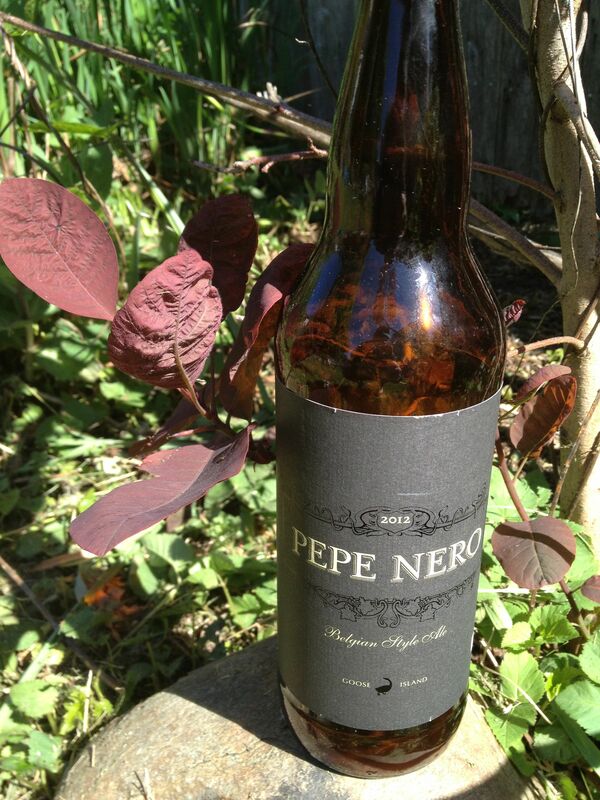 The final beer in the vintage line for us was the Pepe Nero. Listed on the brewers website as having an aroma of roasted chestnuts, I found no distinguishable smell for this beer, however the flavor was great. 2 out of 4 of the party really enjoyed this beer and were quickly reaching for a second sample. Prior to the invention of the stainless steel keg, all beer was brewed and shipped in wooden barrels. At that time, the brewers took extensive measures to ensure the barrels were free of any influencing flavors that could leak into the beer. Lately, the craft beer world has been taking barrel brewing in new directions, and trying to leverage the potential residue from the previous contents of the barrel. It is not uncommon to see beer aged in wine barrels, or bourbon barrels, both from varying amounts of time, allowing unique character and flavor to develop. When I was purchasing the beer for this week, I was talking to the owner of the liquor store about Goose Island. 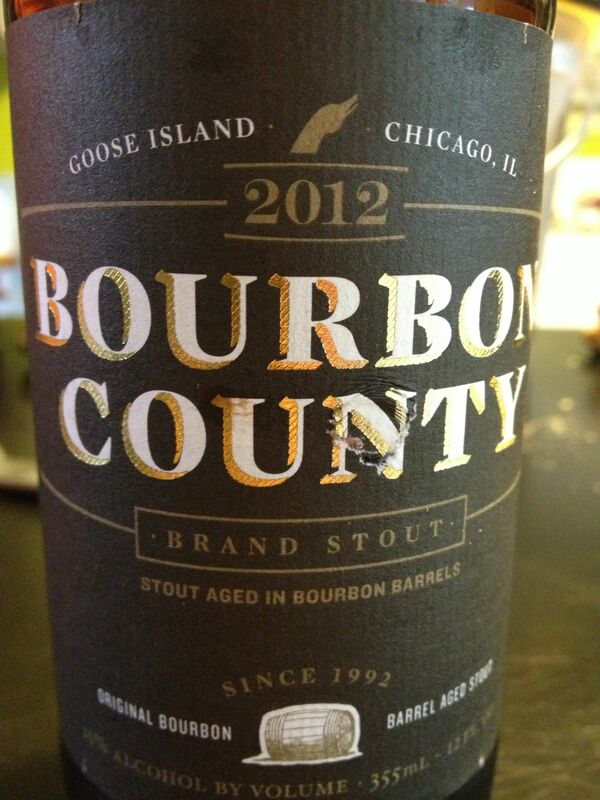 Just as I was about to leave, he asked if I ever had Bourbon County. 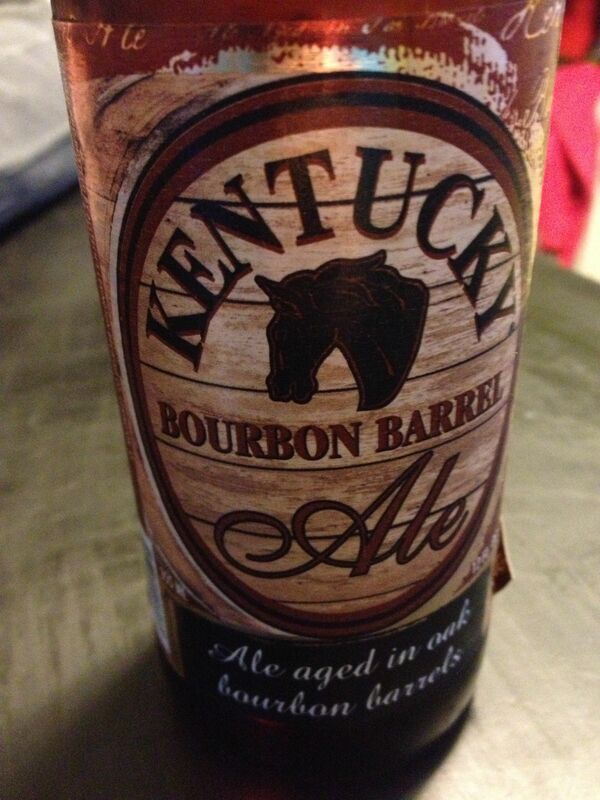 This is a brew that as of this writing is sitting at number 13 on the Beer Advocate top 250 beers list. I said that I have not, as it is really hard to find. With a wave of his hand, he summoned one of his employees to the back room and out came a single bottle. After paying more than I ever have for 10 oz. of beer, I was heading home with a bottle of Bourbon County Stout, our final sample of the week. “Wow, look at the legs!”, was the first comment as this beer was getting poured. Black as tar, with a viscosity of 50 weight motor oil, this beer had all the signs of something unique. The aroma was sweet, dessert sweet. The mouth feel was thick. Not maple syrup thick, but thicker than any other beer of the day, and by far the most interesting beer of the day. Quickly we heard “This needs chocolate,” and a block of 60% dark was chopped up and placed on the table. With that simple addition, the character of this beer quickly changed, and I now understood why this beer is so coveted. Before the chocolate, this was a top 20ish beer, after the chocolate, a top 5. In the end, Goose Island did us no wrong. Say what you about about what is or is not a craft beer, this week we sampled 5 different brews that were something special. Next week, we head south to Alabama.